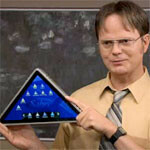 If you watch The Office, you probably got quite a chuckle when Dwight presented the Sabre Pyramid, a triangular tablet. When Eric Calisto saw that episode, he thought that it was a good idea and has decided to pursue developing one. He specifies that the triangular tablet will be Android powered, but there is no information of how an Android app would be displayed on a triangular screen. As of this posting, he only has one backer with a total contribution amount of $1, so we may never get to actually see this creation. Honestly, this seems like an overall terrible idea, but at least he will have comfort in knowing Apple won’t be able to come after him for infringing on its design patents. Apple will put 2 of them together and call it their idea and sue. Unleash the Power of the Pyramid. So when this tablet becomes a hit, movies will have triangular screens. too late im gonna buy 6 iPads and glue them together and make the iCube! ||| |||||||||| |||||||||||||| |||||||||||||| |||||||||| ||| I want This Tablet..:))..Up... Up... Up..
Lmao this is sooooooo stupid... I bet Steve Jobs just fell out of his grave laughing at this crap tablet. Isn´t the ipad rectangular? Then why not make a square tablet?